talents in his childhood itself. 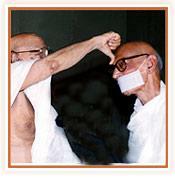 He renounced family and all worldly comforts and embraced monkhood at the tender age of 10 on 29th January 1931. Mahapragya’s journey to spirituality started as Muni Nathmal. Acharya Shri Tulsi nominated Muni Nathmal as the Nikaya Sachive (Secretary) of Terapanth in 1965 at Hissar (Harayana) after being Agraganya (Group leader) for almost 21 years. His intuitive powers and his yearning to learn more and more earned him the title of ‘Mahapragya’. From ‘Mahapragya’ He became Yuvacharya Mahapragya which is the highest position preceding only that of Acharya in accordance with Jain Terapanth sect and attained Acharyaship in 1995.